I’ve had this paper by Graphic 45 for awhile and it’s been sitting in my stash waiting for just the right project. 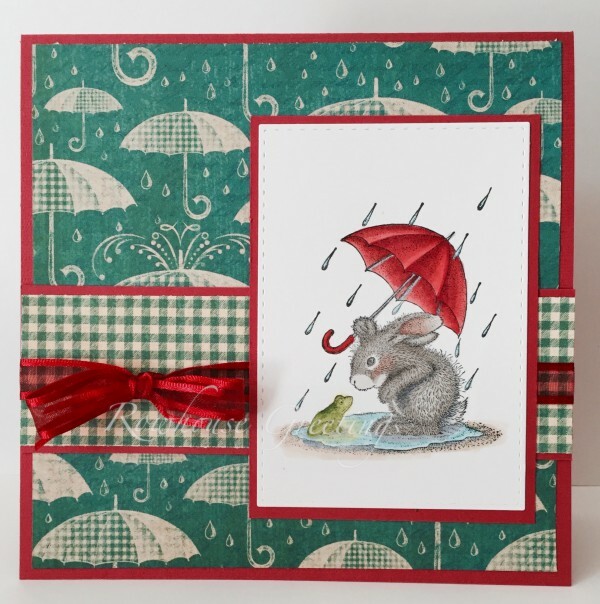 So when the House Mouse Monday Challenge (HMFMC192) came along with the theme “April Showers” it seemed like the right time and the right card to put this paper to good use. Previous Thanks for Bringing Sunshine! Next Bring on the Happy! The papers are perfect for this sweet image…beautiful card!!! Thank you for playing along with us at House Mouse and Friends “April Showers”!! Good luck and hope to see you again next challenge! Saw this on facebook, absolutely adorable. That paper is wonderful, love Graphic 45! And your color work on the image is awesome. Love the gingham strip and the pop of red. Thanks for sharing your card and joining the fun at the House Mouse and Friends Monday challenge. Gorgeous card and your coloring is fabulous! Thanks for joining us at House Mouse and Friends Monday Challenge. A fabulous card, I love your design, colours scheme and perfect papers…….gorgeous colouring for the cute image and super red ribbon! !